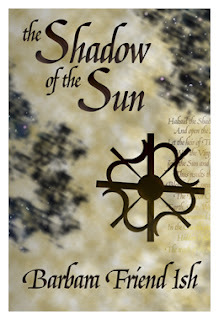 The Shadow of the Sun (The Way of the Gods #1) by Barbara Friend Ish is an immersive epic fantasy narrated from the perspective of anti-hero Ellion Tellan. Ellion Tellan's thirst for dark magic has already cost him a promising life as royalty in line for the High Priest and ard-righ, and now his new life is about to crumble apart with the assassination of the current ard-righ. Every one Tellan knows – his old and new circle of friends – are soon packing their bags to travel to an elaborate, hedonistic celebration where the new King of Kings will be chosen. Rather than face gossip and watch someone else be chosen as ard-righ, Ellion now flees the human realms in the hopes of losing himself as a harpist among the Tanaan royalty. Yet even in Tanaan lands, a dear, estranged friend runs into Tellan and demands that the wizard-turned-bard once again draw upon white magic, this time to protect Tanaan princess Letitia from a mysterious renegade magician. Tellan aches for his old life and senses the chance for redemption, and so he agrees to accompany the princess as a bodyguard, not as a wizard. Yet, the further Ellion travels with Letitia, the stronger the pull of dark magic becomes. Years of self-imposed abstinence may yet prove a poor inoculation against the seductive call of old, black magic emanating from the earth itself. As Ellion battles his inner abyss, he must choose between gratifying the desires of the self and protecting others from the consequences of his sensual abandon. Barbara Friend Ish weaves together a morally complex fantasy world on the brink of a magicians' war on par with Ellion's inner conflict. As Ellion Tellan crosses between human and Tanaan lands, we learn much about the histories of and the different cultures of Friend Ish's world through natural exposition that prepares readers for the epic revelations to come. In addition to the differences in human and Tanaan languages, Friend Ish expertly employs ancient language and translation issues to fuel the mystery behind the renegade wizard in a way that is so much more than your standard 'vague prophecy.' “The Shadow of the Sun” will leave readers craving the next grand installment of wonderfully crafted detail and soul-wrenching existentialism. From details beautifully inspired by Celtic mythology, to a mature consideration of sexuality and gender power play, The Shadow of the Sun gives experienced fantasy readers a delightfully dark bone to chew. Thank you so, so much for your kind words, and for taking the time to review in the midst of your so-busy life! There is no pleasure quite like watching a reader "get it".